I love to take my kids to the zoo! They have so much fun seeing all of the animals and learning about them! Before and after we go to the zoo, we love to create simple zoo animal activities for my toddlers and preschoolers to help them learn the animal names and more about them! 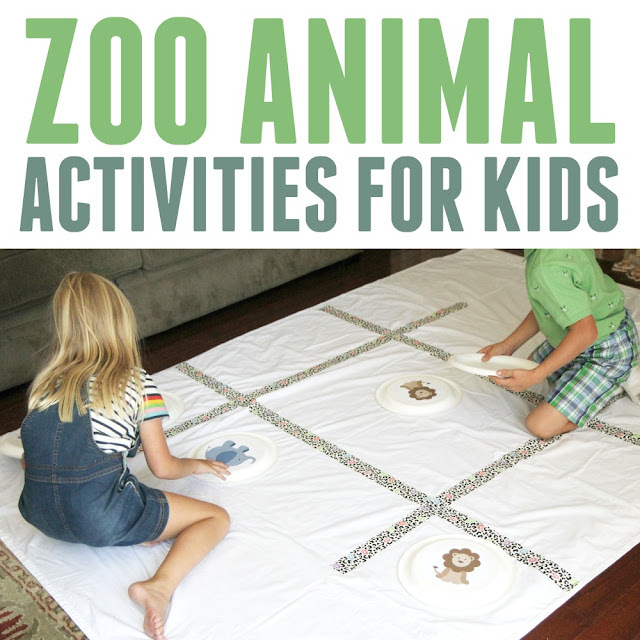 Today I am going to share two of my favorite zoo animal themed activities that we love to do at animal themed parties and during our annual Zoo Week! This week we are reading Goodnight Gorilla by Peggy Rathmann as we participate in zoo week with our Weekly Virtual Book Club for Kids friends! 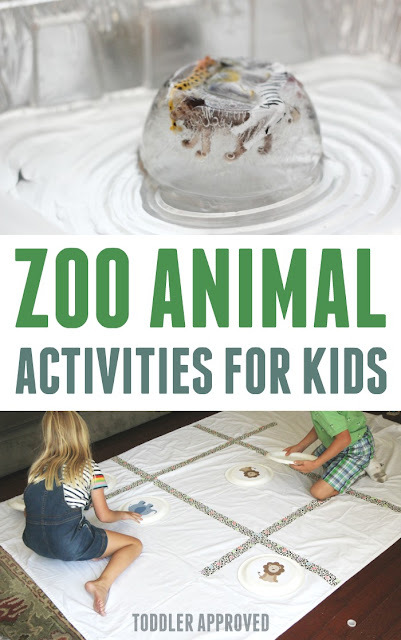 This zoo animal themed science activity is fun for kids of all ages! Take your plastic animals and put them in a plastic tupperware. Fill the tupperware halfway with water. Next, freeze the animals, water, and tupperware for a few hours. Then add water all the way to fill the entire tupperware and freeze overnight. Once the animals and water are frozen in the tupperware, pop them out and place the chunk of ice in a large aluminum baking pan. Give kids cups of warm water and cold water and rock salt and a spoon and encourage them to squeeze water on the ice and explore the salt and see how quickly they can excavate the animals from the ice. Encourage the kids to make predictions about what will happen when they add warm or cold water, how they can make the ice melt faster, and what tools will help them the most. Once they have excavated all of the animals, rinse them off so that the kids can play with them! This simple zoo animal themed science activity teaches kids about liquids and solids and helps them learn about cause and effect. Some of our favorite zoo animals are lions and elephants! For this quick and easy tic tac toe game, we made our own homemade board game and paper plate game pieces. Play tic tac toe! Each kid gets a turn to place their paper plates on the board. The child that gets three in a row wins the game! For little toddlers, I love to help them try and put an elephant or lion in each square and we skip the actual tic tac toe taking turns game part... since sometimes that can be over their head! 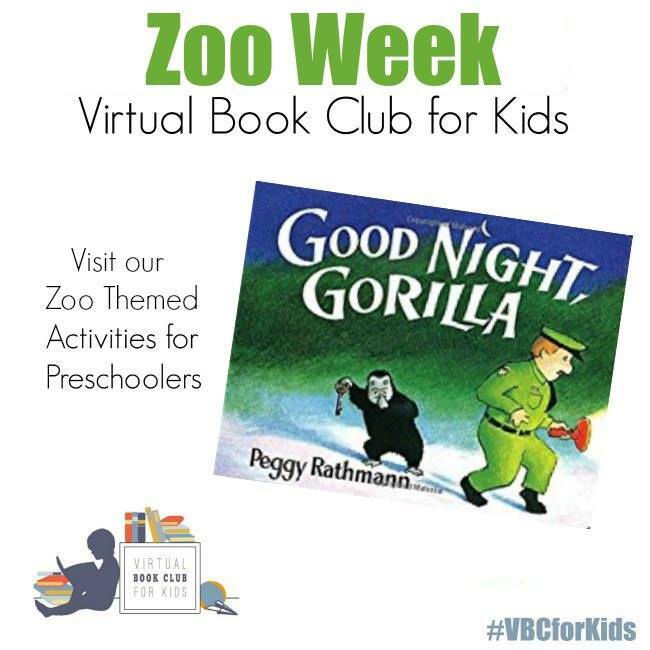 Several of our favorite Virtual Book Club for Kids bloggers are sharing other favorite Goodnight Gorilla inspired zoo activities this week. Make sure to click on the links below to check them all out.